All Saints' Frontal for Ordinary Time was dedicated on Trinity Sunday, 22nd May 2005. The frontal and accessories for the Communion Table were made to replace the outworn old ones; the need for new furnishings was a great opportunity for a community project. As many people as possible were involved: each stitcher was prevailed upon to do a sample and then complete a word or part of the text. This was then joined to all the rest and applied to the background by Patricia Gregory, who made all the items. It took 6 months to complete. "The text draws equally on the Jewish and Christian background (Chagall, of course, was Jewish). 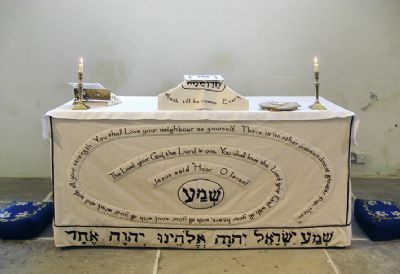 The text is the Jewish call to prayer, the Shema (“hear”). It was quoted by Jesus, who linked two separate commands in the laws of Moses, one from Deuteronomy and the other from Leviticus, to précis the Ten Commandments. In this way, Jesus underlined that the relationship which we have with God is bound together with the relationships we have with our neighbour, the person with whom we have to deal (whether we regard that person as a friend or an enemy). The spiral indicates that it all takes its source in the central call of Jesus, the word of God, from whom all things proceed. It also shows how our obedience to God needs to flow out to the whole of life." The embroidery brought together differing people in the parish and beyond, making it a community venture from which all benefited, especially through getting to know and love our neighbours.